I wrote this short story very recently, for a contest whose theme was “Love and lust”. Sadly it didn’t get selected, I still hope you’ll find it entertaining. I’m happy to receive constructive feedback about my style or storytelling techniques. Warning: as the theme might let you guess, this text contains scenes of a sexual nature. Please only click on “Continue reading” if you can handle it! I started to write this story more than two years ago. It started with a silly, funny story I wrote for a colleague named Isabel. I finished it today, after talking about dinosaurs with my friends’ children in the South of France. Isabel was standing by a still pond. In the windless morning, the water was truly unmoving and grey. She couldn’t recollect how she had arrived here, only that she had felt compelled to stop by. Something was missing but she couldn’t wrap her mind around it. It kept on eluding her – something in the corner of her eye, a nagging feeling that… what? The pond, as wide as a small lake, mirrored the unbroken sky. Nothing was stirring in the liquid expanse overhead, not even a… ah, the thought had left again. The dark water was still calm, but if she stared long enough she could make out darker shapes, big, dangerous fish lurking underneath, undisturbed by… by nothing, really. The reed bordering the edge looked inconspicuous and safe. She slowly walked around the pond, embracing the mountains far away and the slowly setting sun. She tried to sharpen her senses. All she could hear was the chirping of… no, the bristling sound of the trees and the fluttering of bat wings. Wings. Interesting. She thought of… butterflies, exactly. The reed was everywhere on the shore, perfectly nice and clean and out of the way. A bit incongruous. It was clearly trying to elude her attention but it looked much too calm to be true. “Isabel…” she forced the thought… “Isabel Swan… You can remember… You can do it… Isabel Swan, that’s my name, a swan is… is something you’d find here… It’s not a swamp, no… like, swooning maybe? Or… swimming?” A sweet swearing word escaped her. Sixty-six million years ago. The sentient reed couldn’t stand them anymore. Those huge, hungry beasts were either trying to gulp it down or to devour each other. If only they had managed. Instead, they would trample flat every reed they would not eat. The clever plant had to do something to get rid of them. So it created a spell – because the self-conscious reed was also able to make magic, quite frankly the only species on Earth – to curse the dinosaurs and all their descendants. It made itself poisonous so they would die when they ate some reed, or something that had eaten some. The dinosaurs disappeared in the snapping of a straw. And now, you might remember, the birds were the dinosaurs’ children. In the reed’s parallel reality, they never existed because of the curse. Was Isabel from a different world? Why did she know about the birds? She snapped reality back to where it should have been and gave life to the birds again. They now roam the Earth as they were supposed to. They grace our skies with feathers and flock dances, our lands with eggs and songs. The doors of the overground carriage shut loudly, isolating me from the still slightly crowded platform at Whitechapel station. It was already late and I just wanted to go home and sleep. I was trying to shake off my growing, unexpected uneasiness by staring at my phone and I nearly didn’t notice something was wrong until an emotionless voice stated for the whole train’s benefit: “Stepney Green”. Wait… That wasn’t the line or even the direction I was supposed to take. I wondered how I could have jumped on the wrong train, but I guessed I hadn’t paid enough attention. I had to go back. Chuckling inwardly to reassure myself, acknowledging that these things happen, that this was just the harmless result of my lack of sleep, I walked down a few badly lit corridors and waited for a train on a shady platform full of drunk teenagers. I was back to Whitechapel in no time. The platform looked pretty much the same as ten minutes earlier, albeit less crowded. This time I triple checked I was entering the right overground, a weed-smelling train heading north west. I cautiously took my e-reader from my bag and started to read a nonfiction collection by Neil Gaiman. I let the stations flow past in a blur, losing track of the world around me until Neil Gaiman asked the readers to look around them and observe their surroundings. I lowered my e-reader and looked. That’s when I noticed I was going back to Whitechapel. Not again? What had happened? Dejected and slightly frightened, with a headache looming over, I got off hastily at Whitechapel and tried to figure out what my options were. It was now too late to take another train. Was the ghost of Jack the Ripper haunting this station? I surfaced under a cloudy night, wanted to call for an Uber, but my battery was out and I couldn’t see any taxis on Mile End. I took a perpendicular street, which looked older and more unkempt than its neighbour. It was a quaint little thing, cobbled and deserted apart from a quiet stray fox. Nothing there seemed to have been built after 1901 and some window sills were holding drying laundry. Utterly fascinated, I immersed myself in this unusual gas lit atmosphere and followed the fox for a while, until I noticed a decrepit sign adorning what looked like stables: “Sights and Stallions”. Interesting… But I couldn’t think about going home on horseback, could I? I had mounted a pony once when I was eight and a camel when I was twelve. That was hardly impressive. But did I have any choice? Wasn’t it the time to be bold and daring? I had to try something and didn’t feel like walking home yet. I knocked at a shabby looking door leading to the brick horse stalls. A tall, bearded man with a top hat opened. “What do you want, miss?” he asked in what sounded to me as a cliché, Oliver Twist cockney accent. His genuine laughter, devoid of malice, filled the empty street. This was all very surreal – the stallion was, I could swear, looking at me with a hint of amusement and everything was so out of place. I mounted the horse with indeed very few difficulties and Belzy – was that short for Belzebuth? – seemed to know instinctively where I was going, for he headed almost immediately North West. After a while though he started to recede, his stride less confident, and he finally turned around. Nothing I could think of doing was working and the horse left me right in front of Whitechapel station. Would I ever go away? My heart racing in a panic, I just ran as far as I could, people looking at me weirdly. I stopped to catch my breath, panting, and found myself back to where I started. I’m writing this on a notebook waiting for the morning train, hoping that this time I’ll manage to get out. I’ll leave this on a train seat and perhaps if I don’t make it, someone else will read it and find me. I’ll be waiting for you in Whitechapel station. I attended a very interesting dialogue masterclass by Claire McGowan – I’ve been trying to practice. Did we really enjoy all these calibrated radio hits? Did you know my name or did you just pretend? Or was I deluded, my head in the sand, lost in my own fame? We were living in wonderland were we to blame? I went for a wistful, Californian-ish mood but it might change later, as well as the pacing. Anyway, I hope you enjoy the demo! This is an “automatic” text, using the same stream of consciousness method I used here, for instance. I wrote it in August/September 2015, when I was looking for a job in the London area, and thinking about living in Camden – I do now! Flickering lights over all those bricks, I trick and play while I rent for mercy and delightfully stumble upon a dark material made of black rubber and velvet. I wish I could stay in those daydreams where I wander aimlessly along wide canals and shallow waters, full of dirty roads when the mind just goes blank. I foresee the cast of an Iron Will, when I just can go everywhere and throw away anything that I ever made in Paris, where I wish to retain only a portion of what was left after you. Curly, long fingertips brush on silky skin while a shark takes its toll on a giant road full of stacks. Be careful, my dear, for you are losing any hope you ever had of retaining a semblance of normalcy. Chaos, chaos everywhere, and it leads to a darker shade under the willow tree, the bridge where dreams and reality meet. You stand proudly on a derelict path, waiting for your destiny to unfurl. Faithful to the last newcomer, you dwell in the suburbs full of hate and shame until you just can’t breathe anymore, your lungs full of crime and blame. Raise your anger my friend, see the red light broadening your way, guiding you to the place among the places, the one you were avoiding and craving for at the same time. I can’t stand my neighbourhood anymore but tonight it feels both great and wistful. On the piss-smelling pavement, old cats from decrepit houses are meowing. Suspicious dwellers close their shutters while teenagers play football on dirty playgrounds. It seems so grey and mediocre and meaningless but also alive and fascinating. At the junction between a real railway and an abandoned one, an open door leading to a council estate is daring me to enter. And so I crouch alone in the dark, in an empty, post-apocalyptic looking courtyard, leaning back against a slightly mouldy cuboid building. I listen. The wind. Creepy noises in the trees. Trains passing by. Police sirens. A weird humming from a nearby electrical cabinet. The lights on the wall, dimmer than my phone’s backlight, don’t make this place more welcoming than a prison yard. Yet I’m not afraid. It feels right to stay here for a while and write. When I can’t feel my legs anymore, I just walk away. I’m still alive… Toujours vivante ! 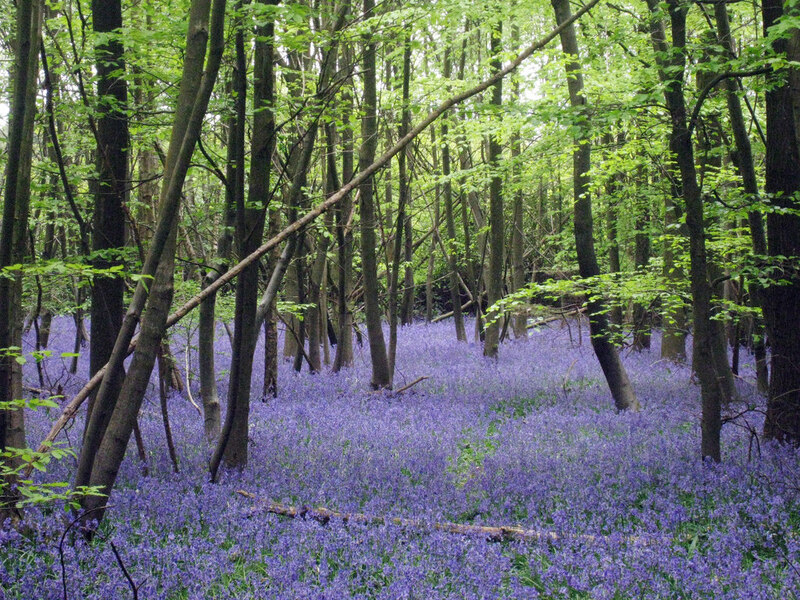 Broadchurch has not only inspired me to write a short text, it has also reminded me of my love for bluebells.